Singapore's National Day falls on 9th August. We are 46 this year and I thought it appropriate to celebrate the month of August with a little Heritage treat that we all grew up with. 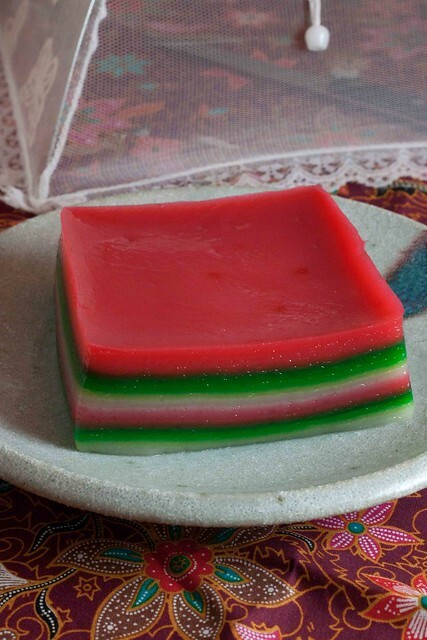 The colourful steamed 9 layer kueh is one that we are all familiar with. I grew up enjoying this treat, mostly for breakfast. Hands up, those who would eat this by peeling it off layer by layer....for kids, this kueh offers a chance to play with food and savour them at the same time. As adults, as much as we are tempted to fiddle with the layers, social decorum in the grown-up world has taught us to eat it with more 'grace' and 'propriety'. There are many variations to the recipe. Most use a mixture of Tapioca flour, Rice flour, Mung Bean Flour and Sago flour. I had attended Valerie Kong's Kueh Class last weekend at Shermay's Cooking School. Her recipe is extremely simple and uses only Tapioca flour and Rice flour. The result is a very soft and tender kueh with delicious fragrance from freshly squeezed coconut milk. For those who are interested in her class, I believe she is still conducting one more class this month. I am not publishing her recipe but would gladly refer you to another recipe which I have found in my cookbook collection- Patricia Lee's Delicious Nyonya Kuehs and Desserts. Will definitely try this out to compare. 2. Mix all the flour and salt together. Pour coconut milk a little at a time and mix till smooth. Set aside. 4. Divide mixture into 3 portions. Leave one portion uncoloured. Mix each of the other 2 portions with red and green colouring. 5. Grease a 9" square baking tin with a little oil. Place the in in a steamer and steam until hot. Pour in the uncoloured mixture (90g) and steam for about 6-8 mins. Repeat another layer with the uncoloured mixture. 6. Repeat step (5) with other coloured batter until all batter is used up. Top layer must be red. Leave the cake to cool at room temeprature for 7-8 hours before cutting. I'm one of those who always eat this by peeling off the layers. Sometimes the you'd get those where the layers can't be peeled off, then you'll know the quality of the kuih is inferior. hand waving! I too ate them layer by layer. This defintely brought back fond memories. Shirley I am doing a Heritage food trail this month, if you have the time, do join in. Will be curious what you can come up with. I am another one who peels them layer by layer and ate them. :) Pretty kueh!! Beautiful neatly layered done by you. Look yummy, I like to eat by pulling layer by layer, yummy! I like chewy type of kuip lapis, peeling layer by layer, simply good. Yes, me too - eat them layer by layer. Beginning to miss this kueh. I'm attending Valerie's class next week, supposed to join the last Sat (same class as you) but changed last minute due to something. Really looking forward to the class. By the way, are u attending her Pau handson class? Your nine layer kueh looks perfect and delicious. I would love to have a slice.... Yours is so neat. Can see it is so soft and smooth. Nice! This is not only crazy pretty to look at, but I bet it tastes great also! @Edith, sure! I will find time in between my travels! Looks beautiful. This is one of my favorite desserts growing up. I love chewy textures. 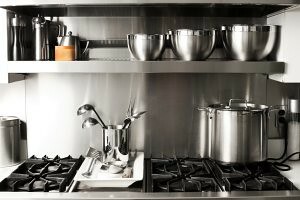 Not a baker but reading directions, you steam layer after layer? Silly question - don't bottom layers get tough? Hi Eleanor- not a silly question. I have wondered myself but suprisingly, that is the difference between kueh and cakes. They are very resilient to over cooking. In fact, I have told that it is better to over cook than to undercook it. I really want to make this but don't know if iI'd be able to find sago & mung bean flour. Any suggestions? Thank you so much for posting this. This is one of my childhood favorite that you don't often find in the middle of US. Definitely brought back some wonderful memories. Thank you! You know I didn't know that the rainbow color for this kueh was only specifically used in Spore until I went to Malaysia. Malaysia's version was a tri colored red, pink & white only. I did this once too and didn't add enough sugar. :P will try your version next time. ;)) yes, a classic childhood treat! Hands up! I eat it layer by layer too! I absolutely loved this as a kid and would taking such great pleasure by peeling it layer by layer. I love eating this kuih but I have no patient to make it. Love the vibrant color. Childhood fav! I usually would either gobble up them or layer by layer. You have alot of patience to make this. I love how the colours stood out. I am first time to walk in your blog...is a "deliciou" blog! 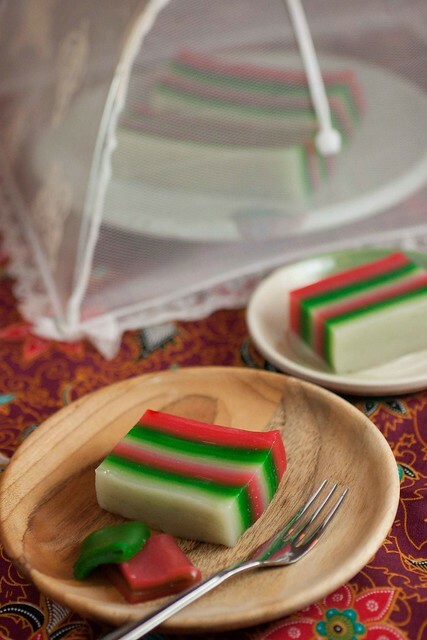 !This layer kuih lapis look colourful and yummy!! I'm not able to get sago n mung flour in china, can i subsitute it with rice flour? I adore traditional recipes that evoke a time and place in our shared pasts. Inspired post! I love this kueh, really colourful and nice to eat! wow! this looks intense!!! I was always under the impression that tepung sagu (sago flour) is the key of this kueh. and you mentioned that Valerie uses on tapioca and rice flour. that leaves me very curious indeed. how does the texture compare to "Lapis Sagu" from begawan solo? Hi, i made the rainbow kueh lapis based on half recipe and the texture turned out too soft and not springy enough...could i know why this is happening? @Anonymous :Can you email me at kokken69blog@gmail.com? I would like to check a couple of things with you first. I like to eat them layer by layer too! 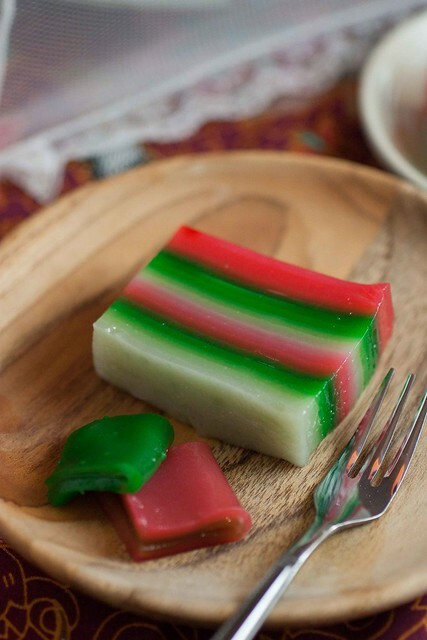 In fact, this is the only reason why I eat 9 layer kueh when I was much much younger - to "play" with it. Looks very nice to eat. I like the color of it.. Very beautiful.. Keep it up.